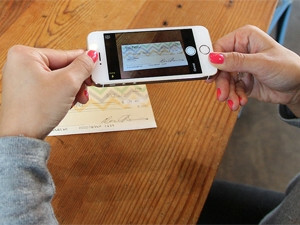 PayStand allows merchants to capture and process paper cheques by photographing them. Silicon Valley start-up PayStand yesterday released a mobile app: a mobile point-of-sale solution allowing merchants to accept credit cards, paper and electronic cheques, as well as Bitcoin payments within the same app. The app is accompanied by a card reader which plugs into the audio jack of the device on which it is installed, and merchants can process paper cheques by photographing them. For processing a cheque payment, the merchant takes a photo of the paper cheque, directly debiting the consumer's bank account without any trips to the bank. To process Bitcoin payments, the app displays a unique QR code, which the consumer scans to pay the merchant from their Bitcoin wallet. PayStand offers a payments-as-a-service model in that it charges a fixed monthly subscription fee rather than deducting a commission for each payment received. Subscriptions vary from $50 per month to $299 per month, depending on which additional features merchants wish to access. "We're trying to create a fair system," says PayStand CEO Jeremy Almond. "Cash is disappearing as more and more consumers are using credit cards, which is the convenient option, but the merchant pays the cost." He explains US merchants pay credit card companies 3% on all payments charged to their credit services. PayStand offers lower credit card rates (2.49% for Visa), and is in negotiations with credit card companies to drop its rates further. Almond hopes that by giving consumers the option of using fee-free payment services like e-cheques at little additional hassle, more consumers will start moving in this direction. Although the start-up's customer base is broad, its no-commission payment model will be of particular benefit to industries with low profit margins; for example, the electronics industry, for which the 3% credit card commission is significant, says Almond. It will also benefit industries dealing in large-ticket items, like contracting, for which even a small percentage is a large amount of money, he continues. Although PayStand clients can accept payments from anywhere in the world, the service is only available to US merchants, says Almond. He hopes to make the service available in other countries within the coming year, he adds. The app is currently only available for iOS devices. PayStand was launched as a company in April 2014 and has been offering its unified range of payment options to e-tailers for several months.